California’s Governor Arnold Schwarzenegger along with MTV’s “Pimp My Ride” will be celebrating Earth Day with a green episode. The show to be aired on April 22 will focus on a 65 Chevy Impala that will be converted to use biodiesel. The Impala will be equipped with an 800 horsepower diesel engine that will run on biodiesel converting it into one ultra clean machine. 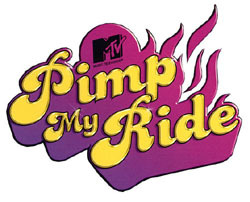 According to Eco Green Supplies this “Pimp My Ride” episode will be part of the MTV year long campaign with theme “Break the Addiction” which hopes to empower, engage, and educate the millions of young people to make smart, everyday choices that will help improve their lives and at the same reduce the impact of climate change and preserve the environment. The Galpin Auto Sports (G.A.S) team who worked on the Impala had a personal visit from Gov. Schwarzenegger who helped with the final touches and provided his own eco-ideas to the car. After the testing of the vehicle, Gov. Schwarzenegger gave his blessing to present the eco-friendly vehicle to the owner.